Those of you who know me will tell you I’ve never used social media ads or Pay Per Click campaigns to market to grow my business. When I launched Virtuoso Assistant just over five years ago I had no business experience whatsoever and I had no money set aside to support myself. Before then I’d worked as a senior legal PA in civil litigation for 16 years. So I had to learn incredibly quickly how to market and grow my business using as many free resources as I could find. I soon realised that the best way I could stand out on social media and get my brand noticed was by creating and sharing captivating visual content. 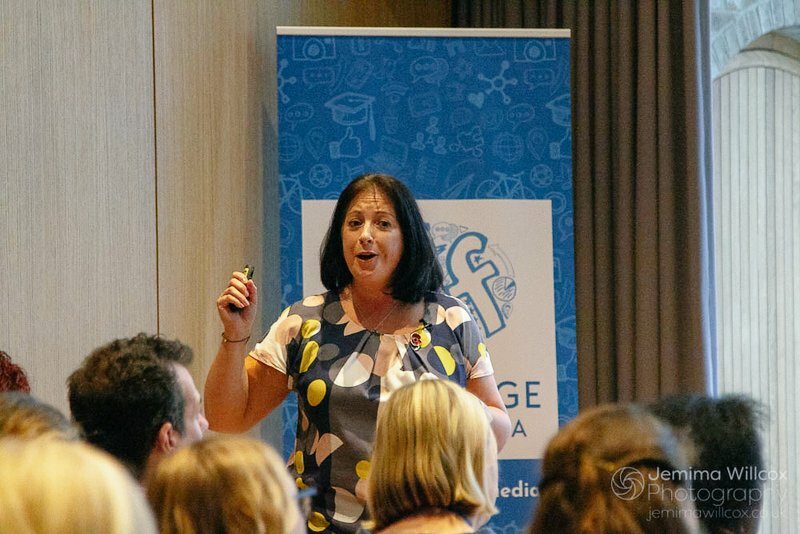 In fact visual content marketing has been so successful for me as a strategy that I had the pleasure of talking about it recently at a hugely popular Cambridge Social Media Marketing conference. So let me start by talking a little bit about Instagram as a social media platform. Why Use Instagram to Market your Business? 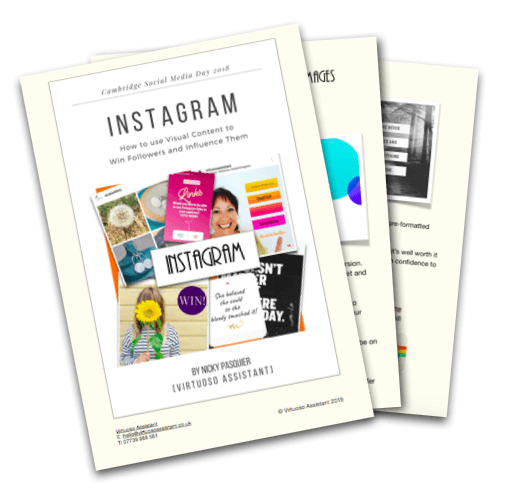 Instagram has grown massively over the past six years, rather like Pinterest which has also grown exponentially but over a slightly longer period of time. 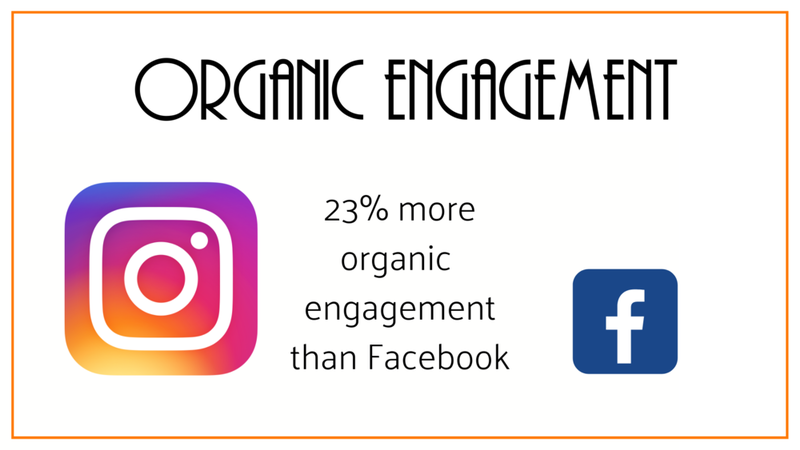 Engagement levels are high and it is still possible to generate traffic organically, unlike Facebook where businesses very much have to ‘pay to play’. So why is Instagram (and Pinterest) proving so popular? Both Pinterest and Instagram have tapped into our love of consuming and sharing visual content in its many forms. On Instagram you’ll find graphics, beautiful photos, quick videos and longer video via the new Instagram TV. There are memes and motivational quotations, which are always popular, as well as interactive content such as Polls and Quizzes on Instagram stories. Okay, so we love visual content but are there any particular reasons why visual content is such a powerful marketing strategy? 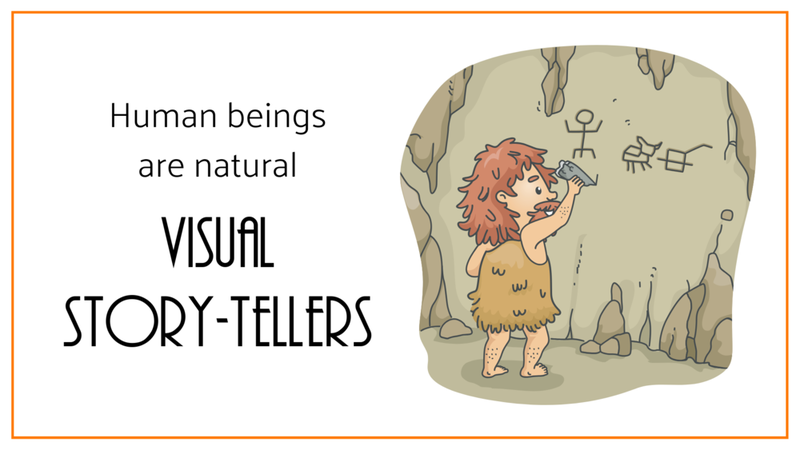 From what we’ve discovered primitive man used to tell stories, share information and express what they saw around them by painting beautiful pictures on cave walls. So you could say visual storytelling is part of our DNA. 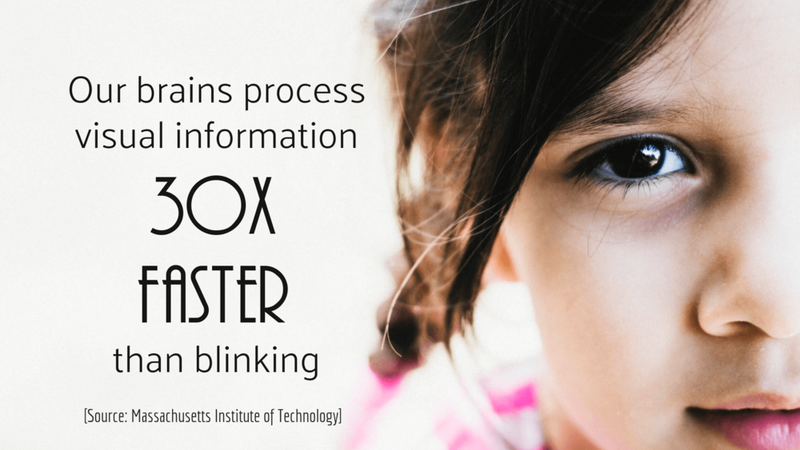 It takes just a fraction of a second for us to digest and process information visually. This this makes visual content ideal for conveying brand messages and educating followers in a format that is super-quick to understand and pleasing to the eye. Tests have also shown that combining text and images can increase understanding, which makes it a very useful strategy for educators. In addition, we are all incredibly busy these days and most of use our mobile devices to consume content on the go. Visual content is not only quick and easy to understand, it is perfectly suited to mobile devices. Think how easy it is to watch a YouTube video, or check our Instagram profiles on our smartphones on a train on during our lunch breaks. From a business point of view the best part of visual content is that it’s absolutely FREE to create which makes it a perfect, long-term marketing strategy for startups and small businesses. Now that you understand why visual content is such a powerful marketing strategy I can now show you how to gain more followers, generate engagement and increase sales on Instagram using my 5-step guide. I’ve just mentioned how it takes a fraction of a second to process information visually, so there is very little time to make positive impact. ➣ Make your brand instantly recognisable online. I’ve set out the 5 essential elements to need to consider when creating your visual brand style in a free eBook you can access here. Next you want to think about how to start attracting all those potential customers. Always create content with your target audience in mind. It's not about what you like or what you are interested in. You have to give your audience what they want. Put yourself in your customers’ shoes and think about what would catch your eye if you were looking for your product or service. Tap into this by creating and uploading visuals that promote a feeling of happiness and wellbeing, since they are more likely to generate more ‘likes’ and get shared. ➣ Competitions - are are a very effective way of increasing brand awareness and attracting new customers on Instagram. ➣ Convey your brand message - remember what we said about combining images with text to increase understanding? Put this to good effect by adding text overlay to images to pique your followers’ interest and instantly let them know what your post is about. ➣ Variety - mix up the format/layout of your posts to keep followers interested. So instead of always uploading square images, experiment with horizontal or vertical images. Add an interesting border with a free app I’ve included in my free eBook. Use multiple images in a collage or swipe file. Record a quick video and upload it to your Instagram feed or create a video on Instagram Stories. Engagement is absolutely key on social media. The one thing that I find frustrating when it comes to social media is the lack of engagement. There’s no point in uploading content and then standing back and expecting something to happen...because it won’t. You must be proactive, make time to engage with people, especially if they’ve commented on one of your posts. Here’s a sneaky trick! Find out who your competitors are, connect with their followers and start a conversation with them. Hopefully they’ll come and find out who you are and start following and engaging with you. The most important thing to do is trigger a conversation because a conversation is how businesses start building meaningful relationships that are crucial to generating new sales. ➣ Connect with influencers - find out who the influencers are in your niche, follow their accounts and start commenting on their posts. Don’t give up after one or two comments; be consistent and hopefully your efforts will eventually be reciprocated. This will raise your own profile. ➣ Captions - there are only 2 lines of text visible underneath each image unless you click on the “...more” link so choose words carefully to immediately grab attention. If someone does click through to read the rest of your caption please don’t present them with a wall of text: there is nothing more off-putting and self-defeating! Instead, do what Jenn Herman, Instagram influencer, does by breaking down paragraphs into shorter, bite-sized chunks. Try sprinkling the text with a few emoji for fun and use CAPITALS to add emphasis on the main points. ➣ Hashtags - ensure your content actually gets seen by the right audience by researching and using relevant hashtags for your niche. Take a look at what influencers and your competitors are using and use their hashtags. Create a branded hashtag that is totally unique to your business and ask followers to use it. Lenka Koppová created a unique event hashtag for Cambridge Social Media Day to generate interest in the event; it was trending at position #8 on the day, which is a huge success for the team. This when the magic starts to happen! This is the point where you’re going to convert all that initial attraction and engagement into leads and sales. Businesses that sell products have a slightly easier time generating sales from Instagram than their B2B counterparts because they have the huge benefits of using Shopify. Once integrated with a business account you can start showcasing and selling products directly from your account with this wonderful tool. It couldn’t be easier. Businesses that sell services on Instagram don’t have the benefit of using Shopify so they cannot sell direct from their Instagram feed. 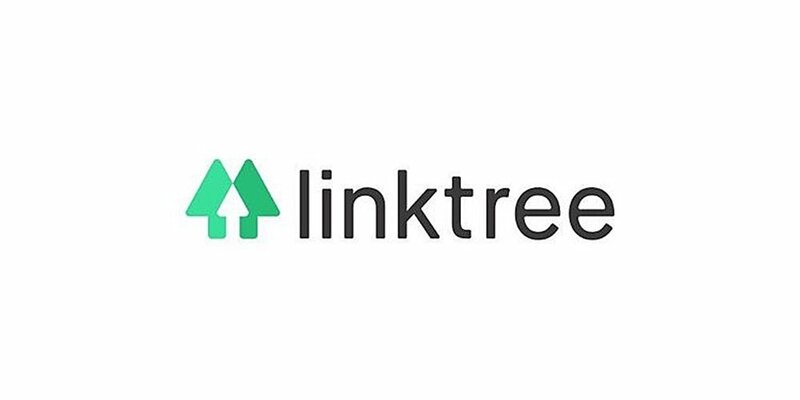 However, there is a tool called Linktree which, once synced with a business account, will provide a user with either one more clickable Call-to-Action button or multiple buttons which link out to sales or landing pages. You can find all the details to set up with Linktree in the eBook I’ve provided for you. The important point to remember here is that there is currently only one clickable link on Instagram that can be used to generate organic traffic and it can be found in the Bio section of a Profile. That is unless you’re like Gary Vaynerchuk and have over 10,000 followers on Instagram in which case you’ll be able to use the ‘swipe-up’ feature in Instagram Stories to generate leads and sales. However, until you reach those dizzy heights, it is crucial that you get prospective clients clicking on that link in the Bio section to generate new leads. (3) Now add a little more text overlay to the image to tell your prospects exactly what action you’d like them to take, like a Call-to-Action. Ensure you focus attention on that Call-to-Action with visual cues like arrows as I’ve done below, or show someone pointing towards your instructions. 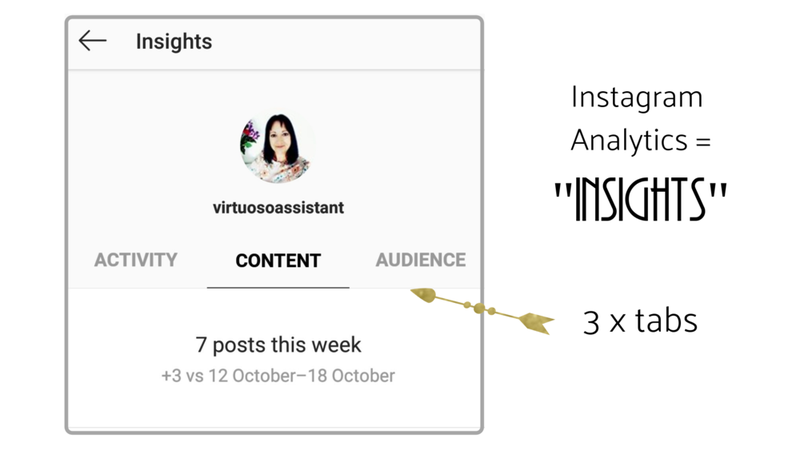 In the example below YouTube expert Sunny Lenarduzzi has combined an arrow as a visual cue and text instructions to get her followers to swipe through multiple images for details of her course. The final image is devoted solely to her call her Call-to-Action. Alternatively you can share a short and memorable URL for followers to type directly into their browsers. These strategies are so quick and easy to use and won’t cost you a penny or a cent to implement. (3) Instead of including a little more text by way of a Call-to-Action, use the captions section to tell people exactly what they need to do. So in this example from Boden they’re inviting customers to click the link in their Bio for a 40% discount. There are so many shopping opportunities coming up between now and the end of January (Black Friday, Cyber Monday, Thanksgiving, Christmas, Boxing Day Sales, etc.) that you can start implementing these four steps to add rocket fuel to your sales 🚀. As with any marketing strategy you won’t get anywhere fast unless you take the time to take a look behind the scenes and analyse what content is working and what is not. Instagram’s own analytics or “Insights” are the place you need to go where you’ll find all the information you need. ➣ Activity - this is where you’ll discover the actions people are taking when they engage with your profile and the number of times your posts are viewed. 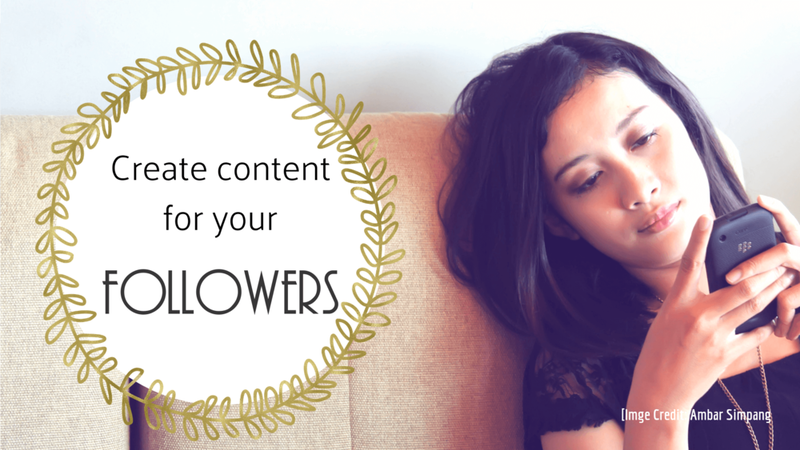 ➣ Content - will explain what kinds of posts are generating the most interest. Once you understand that you can create more of what people like to gain more followers and increase engagement levels. ➣ Audience - here’s where you’ll get a detailed breakdown of demographics which will help you create content for your followers, as I mentioned at the start of this article. The “Followers” section right at the bottom indicates when your followers are most active on Instagram. 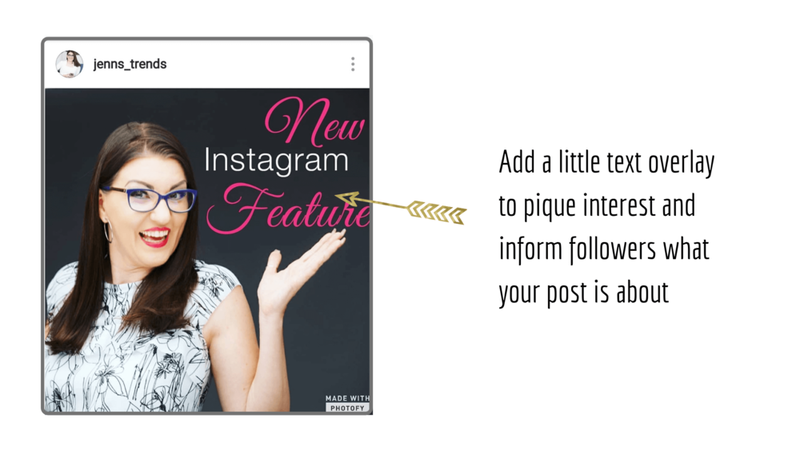 This is will answer the often-asked question, “What is the best time to post on Instagram?” So instead of reading generic answers, here is where you will find out exactly when you should be posting content on your Instagram profile. Analyse your profile so you can see what is working, when your followers are most likely to be online and to create more of the kind of content they love. Before you go don’t forget to download your free eBook which has links to free tools and apps that will help you create that visual content quickly and easily, links to resources and articles as well as the five elements you need to consider when creating your own visual brand style. If you have any questions or comments just drop them in the box below - I’d be happy to help you.